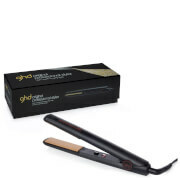 The ghd Healthier Styling Gift Set offers ghd's first SMART styler that predicts your hair's needs. 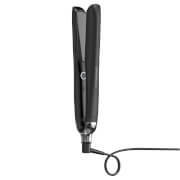 Delivering safer-for-hair heat, the hair straighteners allow you to straighten and curl your hair without the damaging consequences. Predicting hair's needs, the intelligent irons use predictive technology to adjust the power to control the optimum 185ºC styling temperature at all times. Utilising innovative Ultra-Zone® Technology, each plate uses three sensors to ensure the best temperature is consistently maintained across the entire plate to help reduce breakage. Advanced, precision-milled floating plates with high-spec gloss finish provide smooth, snag-free glide, while a wishbone hinge guarantees perfect plate alignment and enhanced styling control. The innovative ghd straighteners deliver ultimate styling results with healthier, stronger-looking hair compared to another styler at 230°C. I received this as a Gift on My Birthday, and i just love it. 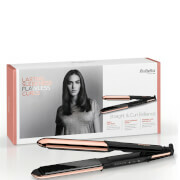 I have tried many straighteners and none compare to these! I have long thick curly hair and I have never had it look so straight and shiny as I have since using these. I once purchased the original GHD's and they did not do my hair any grace so I was hesitant to purchase the new platinum + range... especially for the price but they are such a great investment. My hair stays straight for longer and it looks so healthy. I would 100% recommend these!